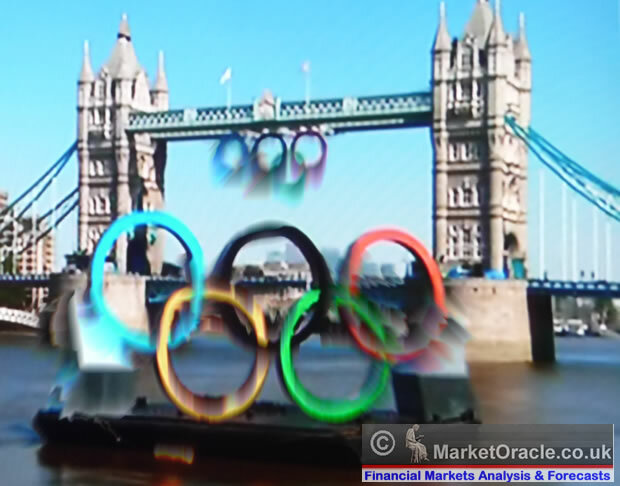 Mervyn King, the Governor of the Bank of England recently forecast that UK inflation would continue falling for the rest of this year which the mainstream press and academic economists / vested interests had been busy regurgitating at length. That is until today's release of the latest Inflation data for July that showed CPI Inflation rise to 2.6% (2.4%) and RPI to 3.2% (2.8%), which led to confusion across the air-waves as illustrated by the BBC's Stephanie Flanders floundering all over the place in an attempt to explain why Inflation had risen when the script everyone had been following was for Inflation to fall towards 2%. 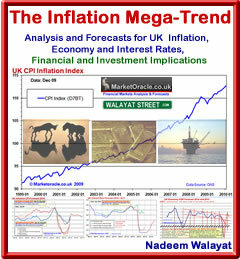 Whilst the inflation data surprised the easily surprised, the conclusion offered by pseudo economists was not surprising, which was that the rise in Inflation was just temporary and that the downward trajectory would resume imminently, which is the same mantra that has been heard for the duration of the past 3 years of always temporarily high inflation with the threat of always imminent deflation. Whilst the reality has been that CPI Inflation has been above the Bank of England's 2% target for over 95% of the time and above the BoE's upper limit of 3% for over 85% of the time, so what is temporary? High Inflation or sub 2% inflation? Never mind actual deflation (minus CPI), that has NEVER materialised. The academics and pseudo economists brought forward virtually every reason under the sun to explain why Inflation has risen from air fares to housing costs, which are ALWAYS said to be temporarily price rises. However what the most vocal commentators most consistently miss is that the primary driver for Inflation is the debt that the government has been busy printing to the tune of an additional £130 billion a year (budget deficit), which the countries central bank (Bank of England) has been busy monetizing by printing money that it channels to the banks to BUY government bonds that the government prints. When you print £130 billion per year you are pouring petrol onto the inflation fire, and when you monetize the debt by printing money then you are in effect pouring rocket fuel onto the inflation inferno as I covered at length in the in-depth analysis - 20 Jul 2012 - The Quantum of Quantitative Easing Inflation is Coming! Similarly the vast majority of Brit's have enjoyed the Olympics 2 week party, how could anyone not enjoy something that has cost near £1 billion pound per DAY! Well everyone except the accountants! However the Olympics party is now over and by the end of this month the feel good factor will have faded from the memories of 90% of the population as they focus on the economic reality of a raging Inflation mega-trend towards which the Olympics acted as an accelerant of loss of purchasing power as illustrated by today's news of public outrage at the increase in rail fares of 6.2% for millions of commuters. Well that is what happens when you PRINT DEBT, PRINT MONEY, It LOSES its value, and what makes matters infinitely worse is that Public Services such as the Olympics are grossly uncompetitive, where there is ZERO conceptual understanding for the need to balance revenue vs expenditure which is why the Olympic's lasting legacy will be one of DEBT as the costs have grown exponentially from the original £3 billion budget to over £11 billion, far surpassing the £2 billion raised from ticket sales and sponsorship. The Public sector that comprises more than 50% of the economy acts as a noose around the economy that strangles competitive industries and entrepreneurship, because one cannot compete against highly subsidised public sector services that exist purely to accumulate debt. Many may argue the case for economic austerity reducing the size of the public sector, however all that has happened is that services have been slashed in an attempt to retain as many of the public sector jobs as possible, thus leaving diminished funds for actual delivery of services. Therefore the governments £130 billion annual budget deficit increasingly amounts to the printing of jobs without purpose as there are no accompanying funds for actual service delivery. The NHS similarly illustrates how the public sector appears to have subverted the coalition governments attempts at reform in the formation of GP Consortia's that is resulting in GP surgeries providing increasingly dissatisfactory GP health services, as illustrated by delayed referrals due to surgeries seeking to make arrangements with health service providers that benefit their consortia's in terms of commissions earned rather than what is in the best interests of patients which is resulting in a huge disparity in what the NHS says it delivers and what it actually deliveries when compared against real patient experience. The bottom line is that the cancer of Greed has infected the NHS, as GP's utilise consortia's to first seek to under spend funds meant for patient care and referrals so that these under spends can be paid out as dividends to consortia GP partners and then ultimately seeking to float the consortia's onto the stock market for huge windfall profits. Which is probably the real underlying strategy of the Conservative party for the stealth privatisation of the NHS by effectively bribing GP's with dividends and floatation profits as I warned would happen 2 years ago. 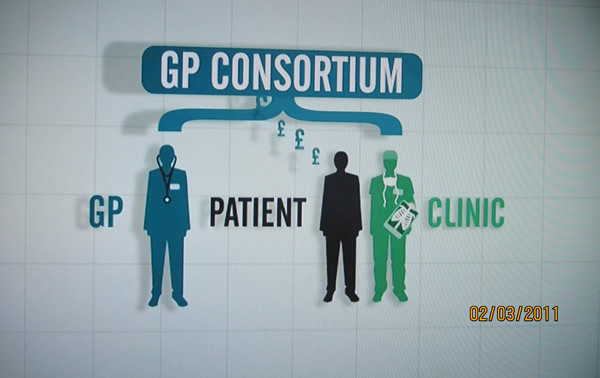 For more on how GP's are profiting from their patients see - NHS GP Doctors Putting Profit Before Patient Care, Channel 4 News Investigation. Whilst the mainstream press and academics focus WHOLLY on the annual CPI Inflation graphs as illustrated above, the reality is that of an exponential inflation mega-trend as illustrated by the below graph that shows that despite the British economy having been in economic depression for the past 4 years, yet it has still suffered inflation of 15%. My next in-depth analysis will attempt to map out in detail how I expect Inflation trend to play out over the next few years, to get this on completion in your email in box ensure you remain subscribed to my always free newsletter.